Built in 1795, three years after the first house was constructed, this dormitory dwelling cost about $2,000. It stood along Shaker Road next to the First House and the Sisters’ Shop to the north, and the Brethrens’ Shop on the north side of Maple Lane. These are gone now, though their foundations can be seen. This is the only Church family dwelling still standing. 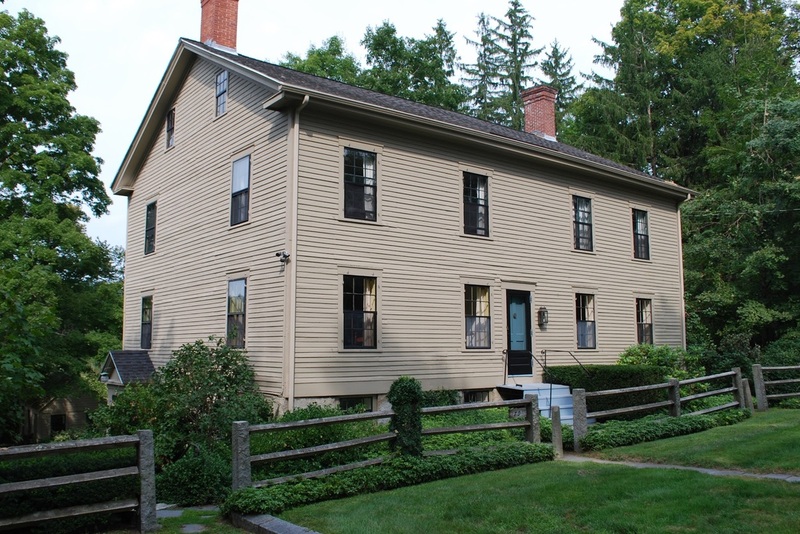 Originally the house had a gambrel roof which was raised about 1860 and altered to gable form. Taking advantage of the hillside location, it has an exposed basement level with full light to the side and rear. dining room, there is a Shaker sink which empties to the outside of the building, indicating that this might have been used as a kitchen. The boards used to make the dividing walls in the current dining room show the Shakers’ use of wide, tapering boards to cover the greatest area of wall. The hand-made hardware on the doors is all original. There is a sub-basement below part of the lowest level. Notice the stiles in the granite and wood fence separating the dwelling from Shaker Road; used instead of gates, they kept large animals out while letting people in. Unlike a gate, there is no chance of forgetting to close it and it is less likely to break or need replacement. View of the Second House from the rear looking east with the Herb Dry House on the left.